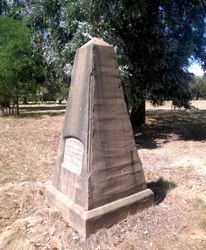 A cairn commemorates explorers Hume and Hovell who passed through the area on their return journey in 1824. 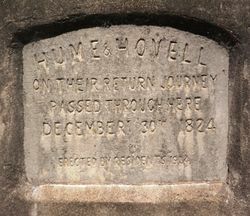 In 1824 Hamilton Hume and William Hilton Hovell, encouraged by Governor Brisbane, led an expedition of six convict servants overland to reach the Southern coast. A fortnight after leaving Hume's home at Appin, the party left his station at Gunning, on October 17th 1824, with five bullocks, three horses and two carts. They were the first whites know to see what we call the Murray River; they christened it the Hume River for Hamilton Hume's father. However in 1830 Captain Charles Sturt, not realising he was the same river Hume and Hovell had encountered upstream, named the Murray River in honour of the then British Secretary of State for War and the Colonies, Sir George Murray. Arriving at the river, Hume & Hovell each carved their name into separate trees. Hamilton Hume's tree was burnt down in fires in the 1840s. William Hovell's tree survives to date, despite a termite attack, and in 2013 a clone of it was planted in Tatong. Hume & Hovell arrived at Corio Bay on December 16th 1824. Hovell had miscalculated at the end, and they thought they were at Westernport.